Chez Moustache Master Barber Cheryl Dumont shares a day out of the shop on a Providence photo shoot. London based men’s style company Mr Porter arranged the shoot with model, stylist and designer Ignacio Quiles. 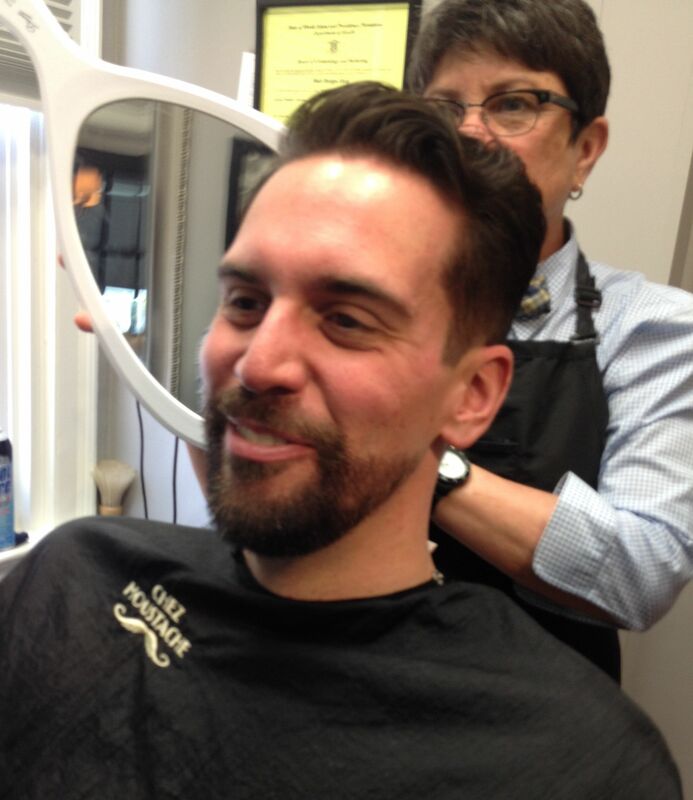 Cheryl supported the shoot as their barber on duty, and had lots of fun taming Ignacio’s beard. Spring Cleaning — did you know that de-cluttering can be life changing? Spring Cleaning at Chez Moustache is more than just cleaning up accumulated items, but can also be transformative. Not only with improving your space, but also by improving you general health. According to Dr. Fader in an article published in Psychology Today, spring cleaning, de-cluttering can be good for our mental health. “Studies have also shown that littered environments encourage more littering; once you make your space tidier, you won’t want to ruin your hard work. Several psychologists and cleaning experts report that they see clients who take charge of cleaning and organizing also take charge of their general health, especially their weight. 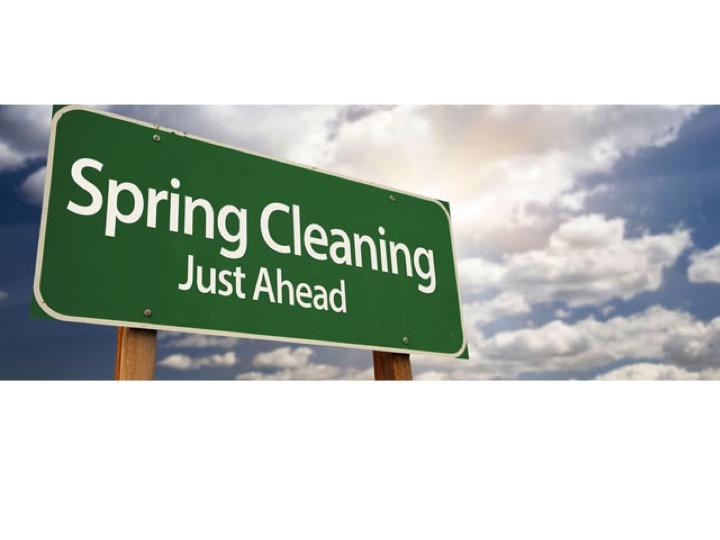 Spring cleaning isn’t just for ridding yourself of accumulated items in your indoor space. Many of our Chez Moustache clients have taken the concept of “spring cleaning” to whole new transformative level. Loosing the length in the back gave this Chez Moustache a “de-cluttered” the neckline. Making more space with less curls. We usually recommend working with curls. However, this Chez Moustache client wanted to clean them up. Tidied up curls — and an excellent example of hair product well used. Clean-up with a passion. 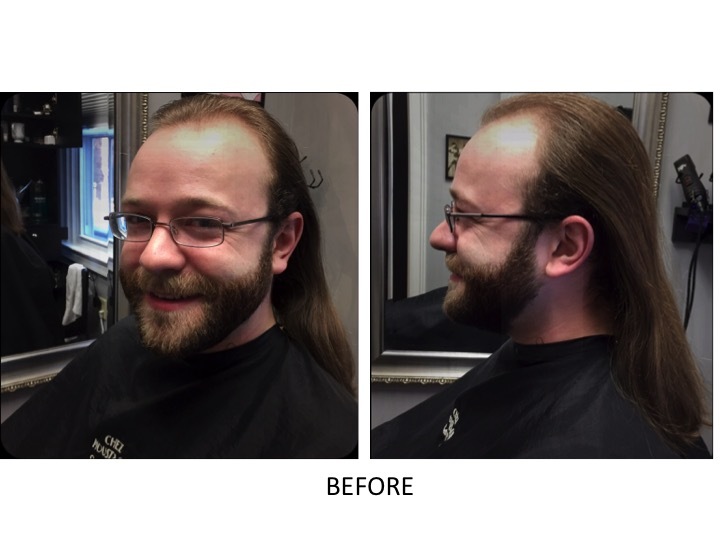 Chez Moustache client, Chris P., donated his hair to “Locks of Love” in honor of the memory of his friends dad who had recently passed. It’s that time of year again, time for considering new goals and a new-and-revitalized you. 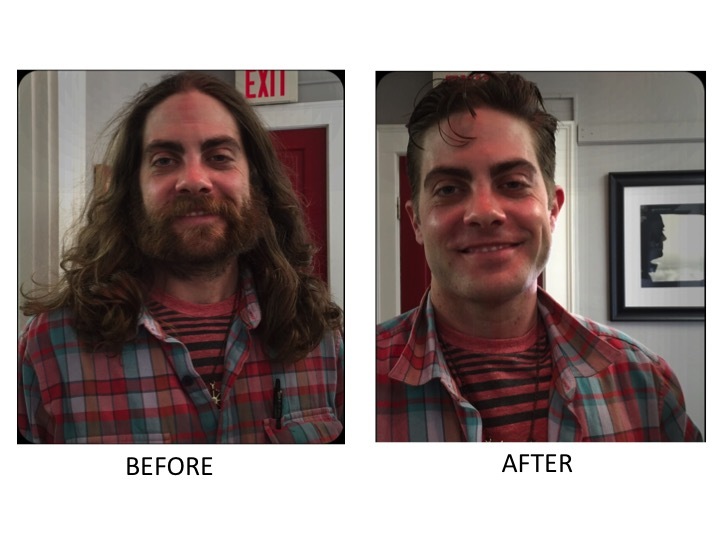 At Chez Moustache we’ve helped many clients achieve their grooming goals. From growing out or removing beards to changing hairstyles, and improving skin conditions. whatever the goals, it’s our pleasure to coach our clients through the process. After months of a longer hairstyle, Tim decided to make a plan to change. Nick’s goal is to grow a fierce moustache for a trip to Las Vegas he has planned in 2015. Research suggests that the clearer the goal is defined the more likely we are to obtain it. 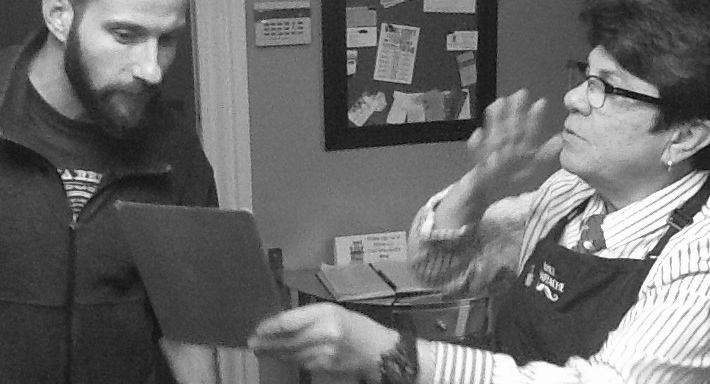 Master Barber Cheryl Dumont is coaching Chez Moustache client Nick on how to train his moustache. Our Chez Moustache waiting room is outfitted with comfortable and stylish furnishings, historical objects, art, and includes a carefully selected number of good reads for our clients to enjoy. Whether Sports Illustrated, National Geographic, Esquire, O or a few good books, the printed word is still a relaxing way to inspire and inform. We know the Chez Moustacher is enjoying this timeless luxury (the feel of the paper, the pleasant flick of turning pages) because we occasionally hear the tear-out of an article that simply must be owned! 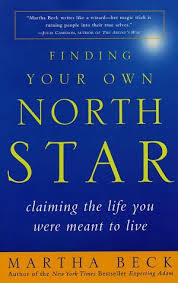 If you are inclined to set a goal this year, but are feeling fuzzy about the specifics then we would recommend reading the book Finding Your Own North Star by best selling author, and life coach to the stars, Martha Beck. The book is a coaching guide to self -reflection that is simple, practical and insightful. List three things that can always get you moving (Examples: “The family New Year’s party,” “Playing pickup basketball,” “Going to the mountains.”). Name three people who bring out your very worst social behavior. It might help to review hour life’s most embarrassing moments; the two are often linked. If your goal or path felt unclear, by the end of Beck’s book and coaching guide you are certainly more likely to have made some headway. 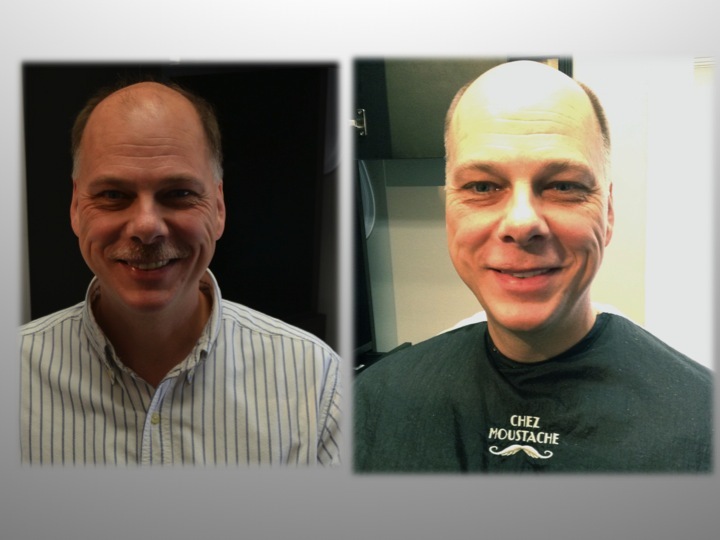 Chez Moustache customer Mike achieved one of his goals in 2015. 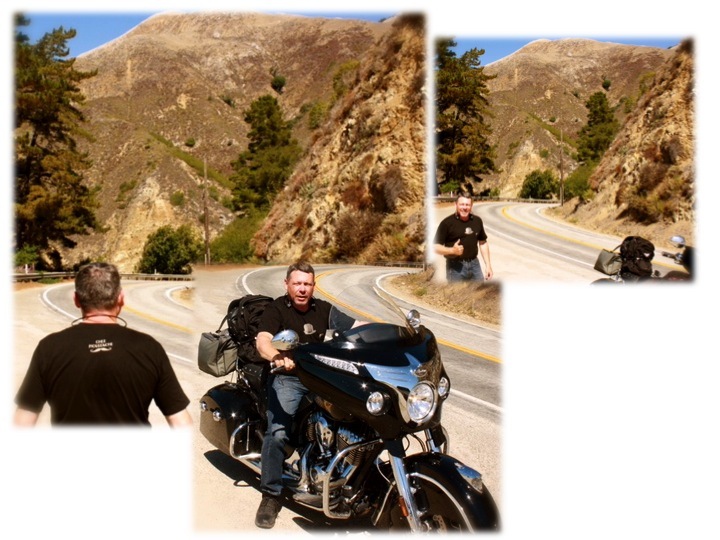 Motorcycle tour in California, and the Pacific Coast Highway. Mike seen pictured here wearing his Chez Moustache T-shirt. If your goal happens to be moustache, beard or hair related you needn’t go far — Chez Moustache coaches are local and at the ready. May you reach your goals in 2015! Picture taken February 2014. About six months into Joshua DeFreitas’s one-year beard growing quest. An unruly grown-out beard is quite different than a well groomed grown-out beard. Yep, he’s growing it out! Joshua DeFreitas is just coming up to the end of his one-year quest. It was last Labor Day when he decided to grow his beard out. Other than some minor trimming and shaping, he hasn’t touched the length of his beard for one full year. 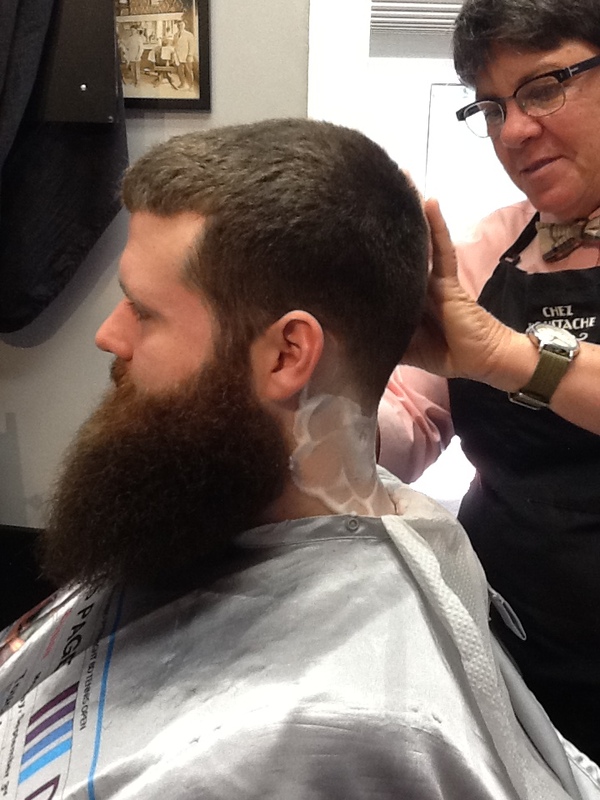 The result is a beard with wonderful length, texture and color. Joshua reflected, “Ever since I could grow a beard I’ve had one.” He’s not sure why, but we think he feels more like his authentic self, bearded. “I have always had a beard, but I could never grow it too long because I couldn’t get past the itchy phase,” Joshua said. That was until about a year ago, when Joshua was inspired to conquer the hurdle. 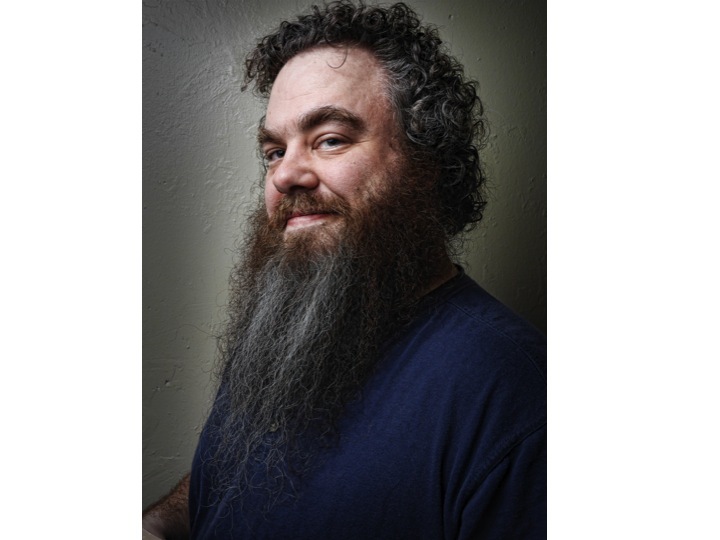 Joshua is an avid reader, and a fan of the fantasy (projected) trilogy book series, “The Kingkiller Chronicles.” Kingkiller author, Patrick Rothfuss dons an impressive, yet unruly beard. Patrick James Rothfuss (born June 6, 1973) is an American writer of epic fantasy and college lecturer. At the end of last Summer Joshua attended a meet and greet book-signing event featuring the author. 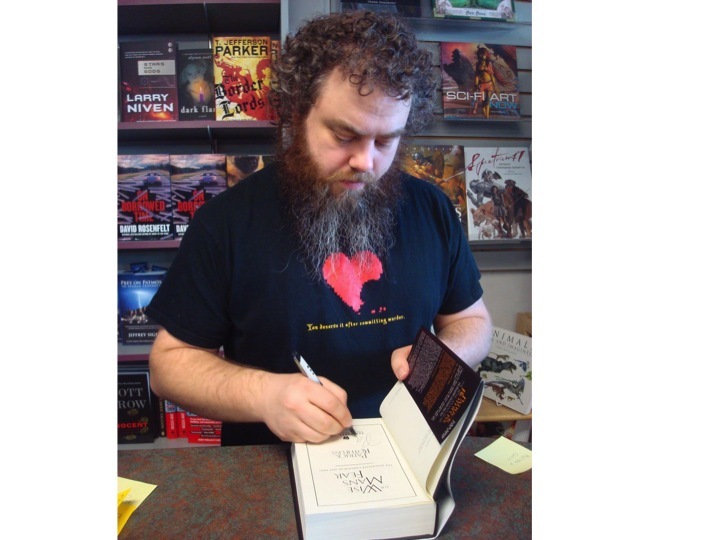 It was there that he met author, Patrick Rothfuss. Joshua waited patiently to have his book signed, and meet one of his favorite authors in person. That was the push he needed, and the inspiration that prompted Joshua to persevere. It’s been a year since that inspiring day, and now his quest is coming to an end. Joshua still hasn’t decided what he’s going to do after Labor Day this year. It remains to be seen — will he cut it or will he keep it? 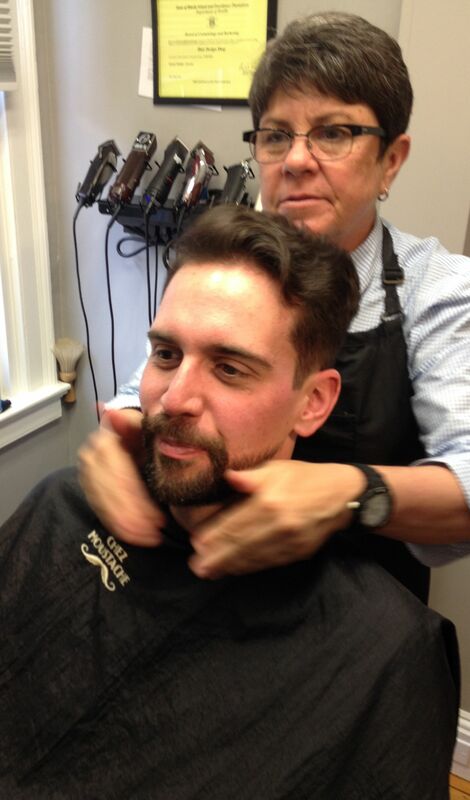 Master Barber Cheryl Dumont shapes Joshua’s beard. 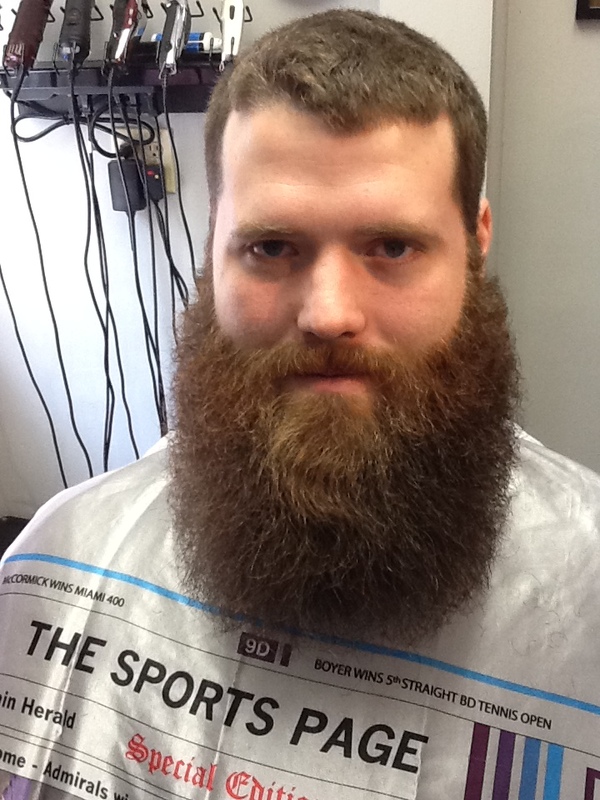 Chez Moustache client Joshua DeFreitas hasn’t cut the length of his beard for just about a year. Picture taken July 2014. Joshua washes his beard daily in the shower with his hair products, and then does a post-shower conditioning with hair cream. At Chez Moustache, we encourage every gentleman’s journey to express their authentic selves. However, we encourage our clients – “don’t be a sissy” when it comes to grooming. An unruly grown-out beard is quite different than a well groomed grown-out beard. Just ask Joshua’s gal. Although long and impressive, it is also clean, well groomed, soft and lovable. You don’t want to repel your loved ones. Grow it out, but for goodness sake – groom it! Stop by Chez Moustache if you need any beard growing or grooming advice! ESPN writer and editor (a.k.a. most guys dream job) Scott Barboza was the perfect candidate to experiment on Chez Moustache’s new product line. Scott came by Chez Moustache to tame his aged post-Bruin game beard recently. Just a few drops are all that it takes. Apply beard conditioners in moderation, twice per day is usually sufficient. 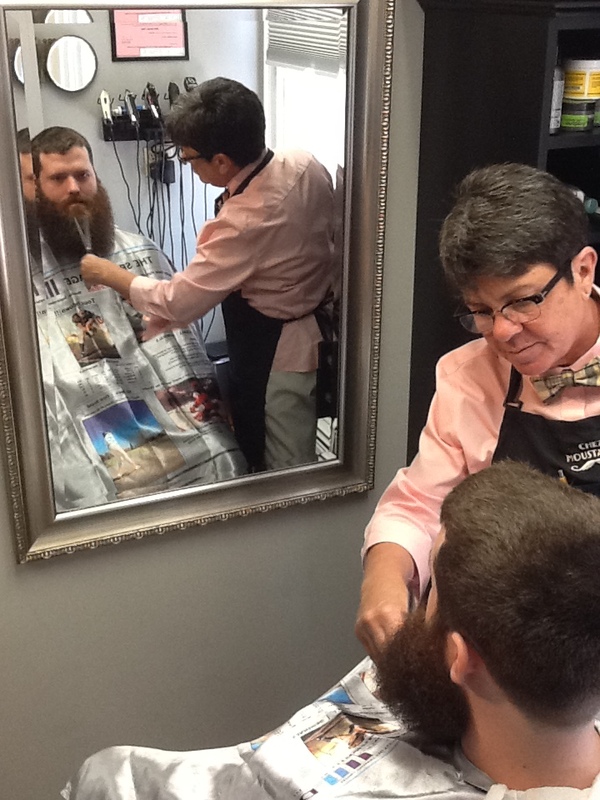 Master Barber Cheryl Dumont applies Mr. Natty’s “Beard Elixir” to Scott Barboza’s shaped beard. Use of a fine tooth comb keeps Scott’s beard smooth and tangle-free. 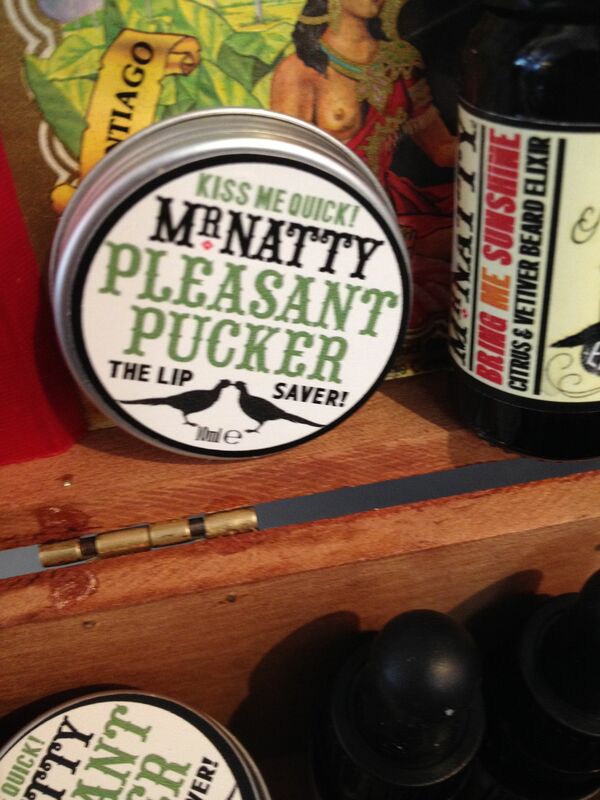 Chez Moustache is liking the product, and loving the marketing and story behind this UK company. Researching new product lines for Chez Moustache is a passion of Cheryl’s. Scott was a good sport and happy to “test” the new line. 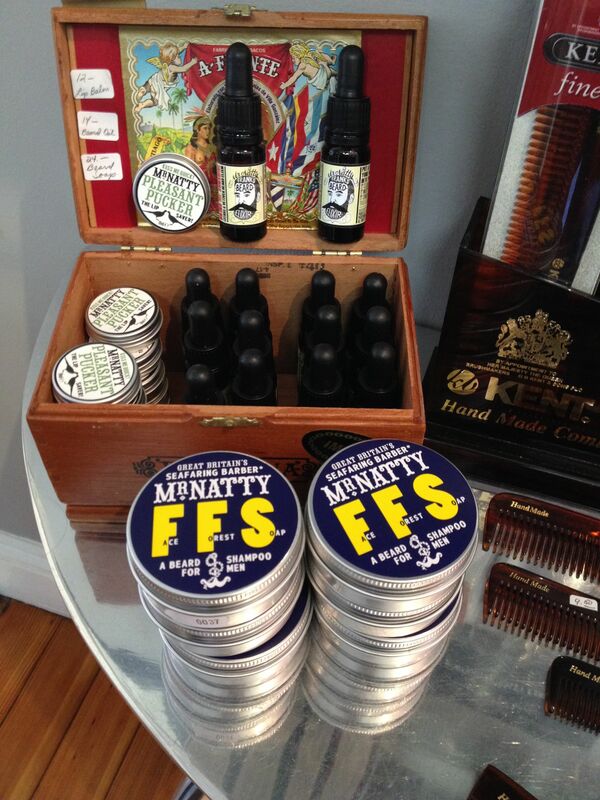 Chez Moustache introduces a new UK based product line. Mr. Natty’s products are made with quality ingredients. The fun names and branding are a bonus. 1. 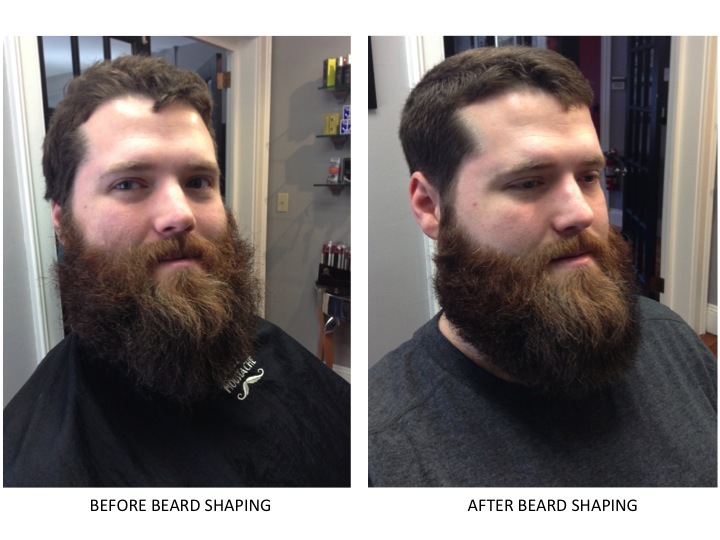 Rely on the Professional to give your beard the best shape possible. Once you’ve got the shape established it’s much easier to maintain. Just remember color within the lines. You can always come back for a re-shaping. 2. The comb isn’t just for your head…Use a fine tooth comb and run it through the direction of the beard growth to keep it smooth and tangle-free. 3. 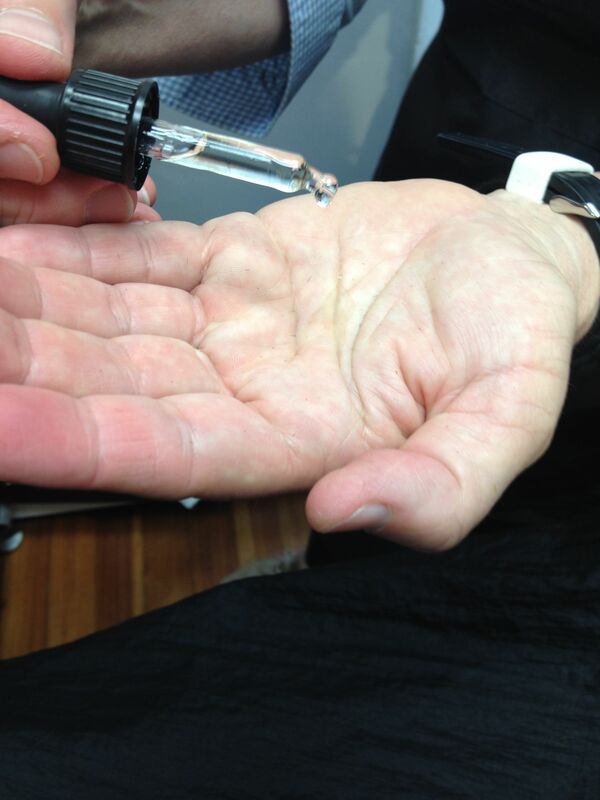 Conditioning…Applying beard oil (or elixir’s) in moderation will keep the beard from being too dry and prickly. Once or twice/day should do the trick. 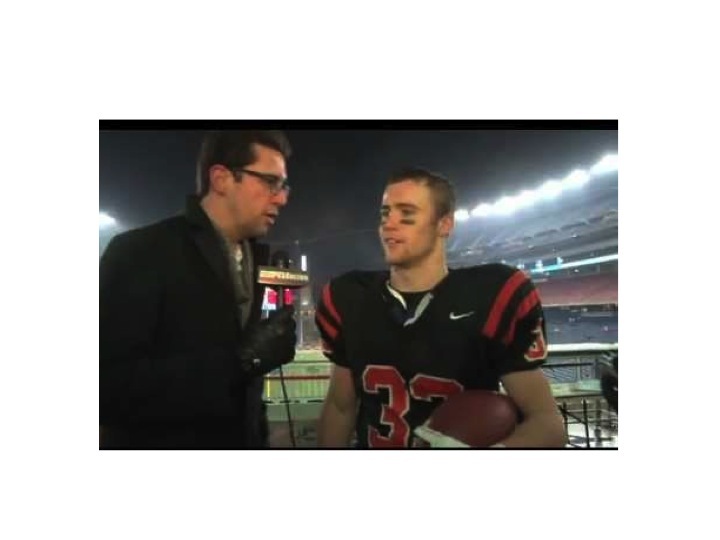 ESPN writer and editor Scott Barboza is camera ready. Great “After” shot. What made George Shave His 34-Year-Old Moustache? The New Year brings with it all kinds of makeovers. Hope for change, new goals to be set, and new resolutions to be made. Believe it or not the number one new years resolution is NOT to grow a moustache or remove one for that matter. Alas, the number one goal that most Americans set is, not surprisingly, to lose weight. Keeping with the theme of change — we were delighted to meet Chez Moustache client George recently and learn how he came to the decision to shave his 34-year-old moustache. 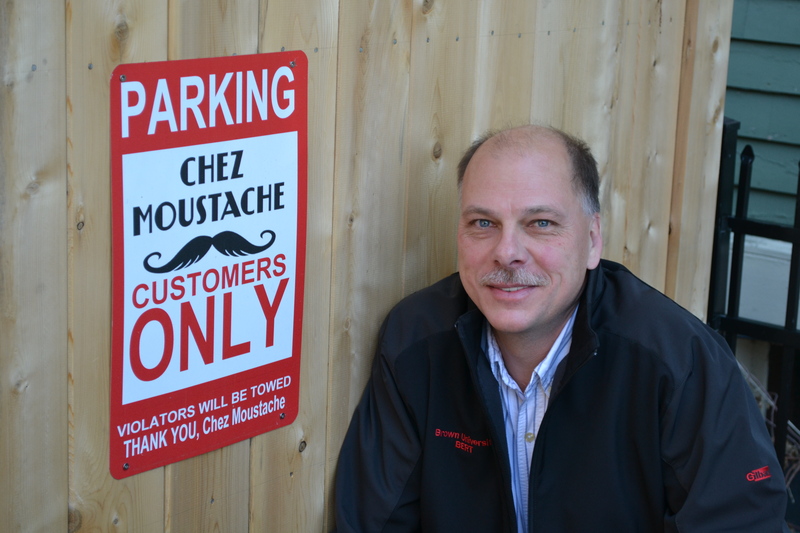 It was a crisp, fall afternoon when Master Barber Cheryl Dumont noticed two women in the Chez Moustache parking lot. They were quite animated, sort of like enthusiastic air traffic control flaggers as they directed a car into the driveway. There was a gentleman behind the wheel of the car, and to her surprise and delight she watched as the women converged on him like the paparazzi. Click, click, click — every move he made was photographed. The women followed him into the barbershop, and the lot of them burst into the quiet shop bringing with them their joyful energy. Jo-Ann was not only successful with her weight loss challenge, but she had a lot of fun along the way. The playful ribbing of George’s moustache take-down turned a bit viral with her online friends and family supporting her every step closer to the big day. 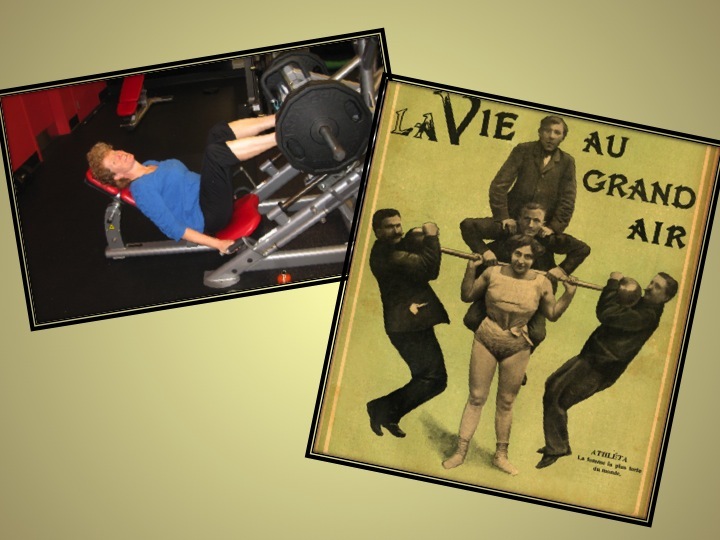 Strength training is an activity known to increase bone mass and thus decrease the possibility of osteoporosis. Whether it be weight loss or a moustache make-over, self-improvement tops the list of resolutions this year. George and Jo-Ann both had their own make-overs. They are a good team who made getting to the goal lots of fun. According to researchers people who explicitly make resolutions are 10 times more likely to attain their goals than people who don’t explicitly make resolutions. 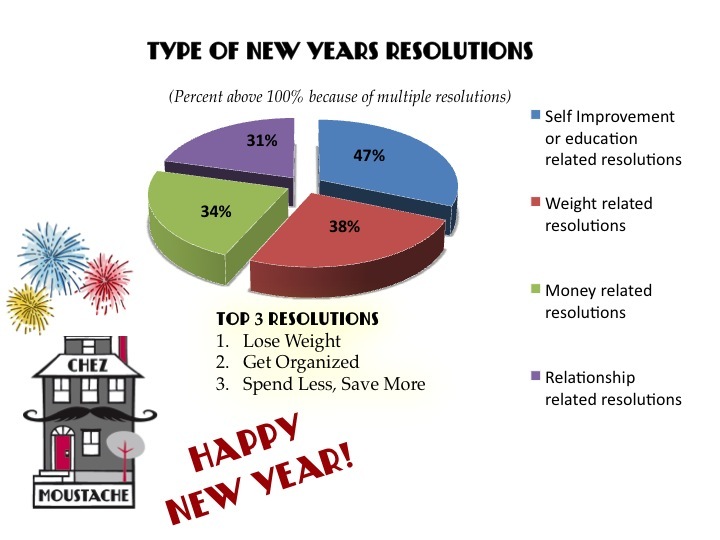 Another well known fact is that the #1 New years resolution that most Americans set is to lose weight. 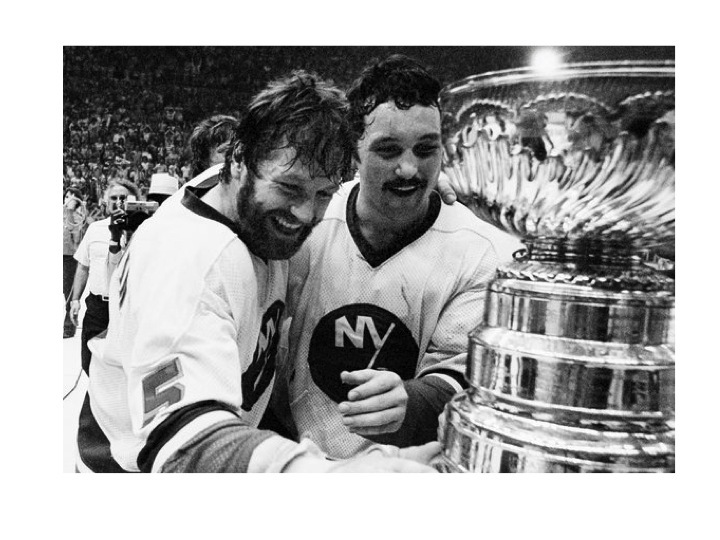 Some point to the National Hockey League, and the 1980 New York Islanders as beard growing tradition starters. The origin of this superstitious practice is not known, but some point to the National Hockey League, and the 1980 New York Islanders as tradition starters. That’s when the team’s players stopped shaving when they entered the playoffs and vowed not to shave until they either were eliminated or won (they won their 1st Stanley cup that year). The NHL playoff beard has morphed into a practice that every sports platform has adopted. And, it isn’t just the professional players who are participating, as fans have gleefully joined the tradition. 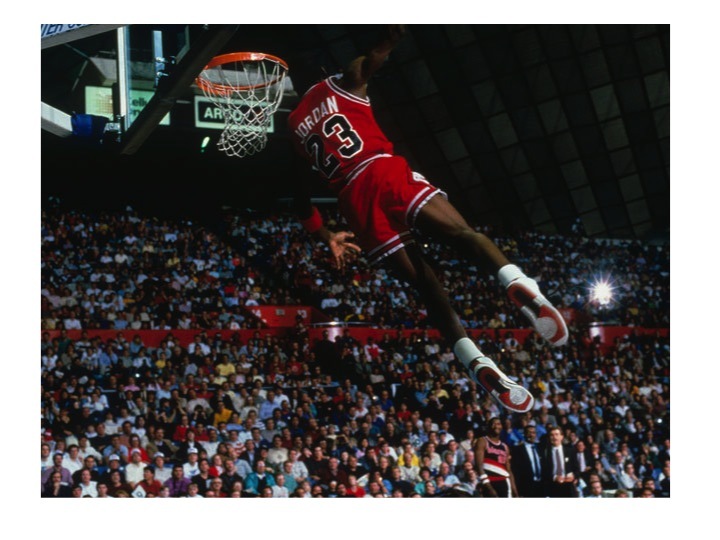 Michael Jordan – Superstitious practices go beyond the beard growers. Chicago Bulls six-time NBA Championship winner and five-time MVP player wore his University of North Carolina shorts under his uniform in every game. Believing they brought him luck, he wore longer shorts to cover them, which inspired a trend in the NBA. But let’s be practical. Most men don’t have the luxury of letting a beard grow rogue the way professional athletes can. In addition to winning the approval of our significant others (who may choose to kiss that mug…or not), we may also have the need to look respectable when picking our kids up from school or giving that presentation at work. So the question remains — how do we participate in the playoff beard tradition and still look respectable in our everyday lives? 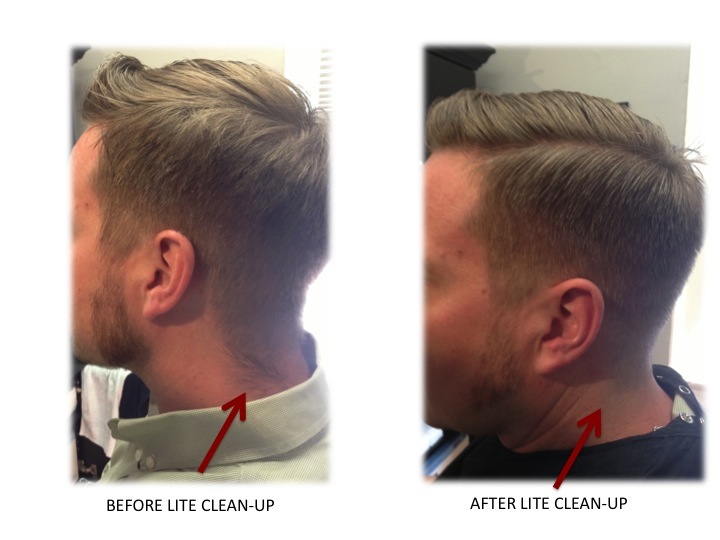 A slight change to the beard’s neckline or cheek line can enhance a gentleman’s appearance. 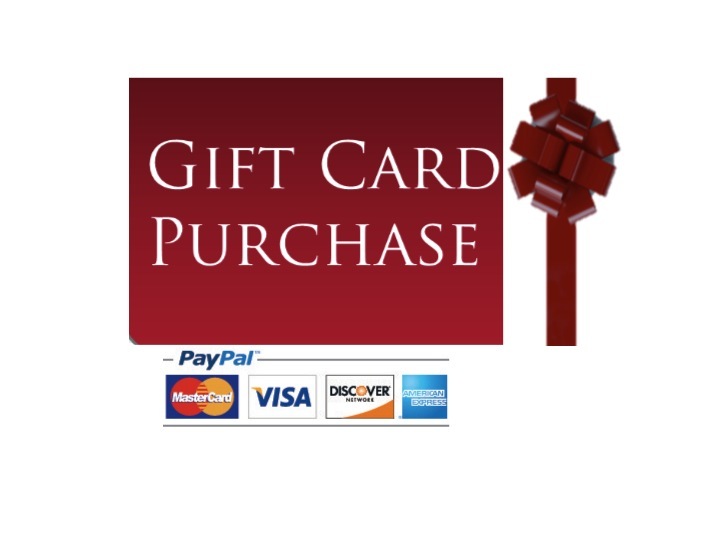 The Professional – For the man that wants to participate in beard growing, but need to keep it clean. 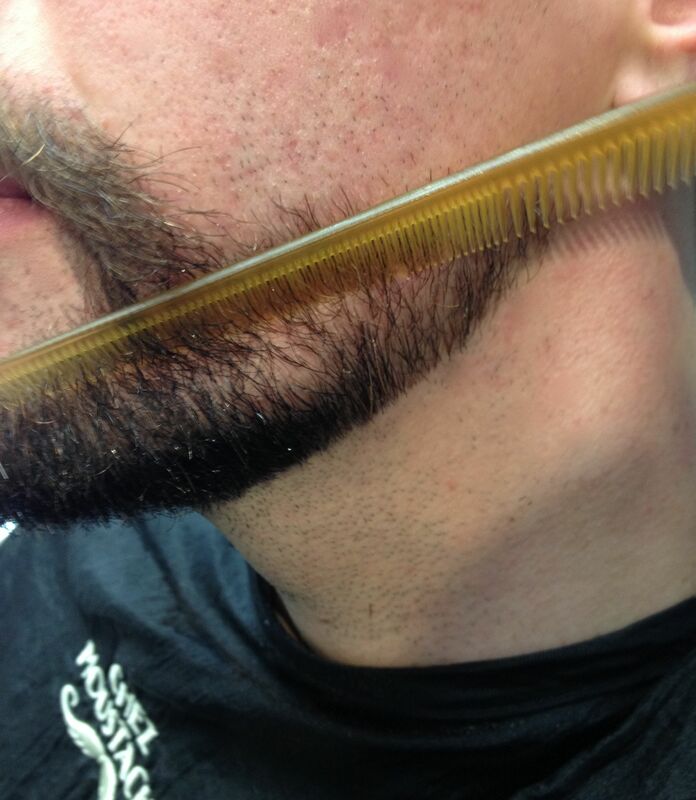 We recommend keeping your beard edges clear and keeping the beard trimmed, neat and tidy. 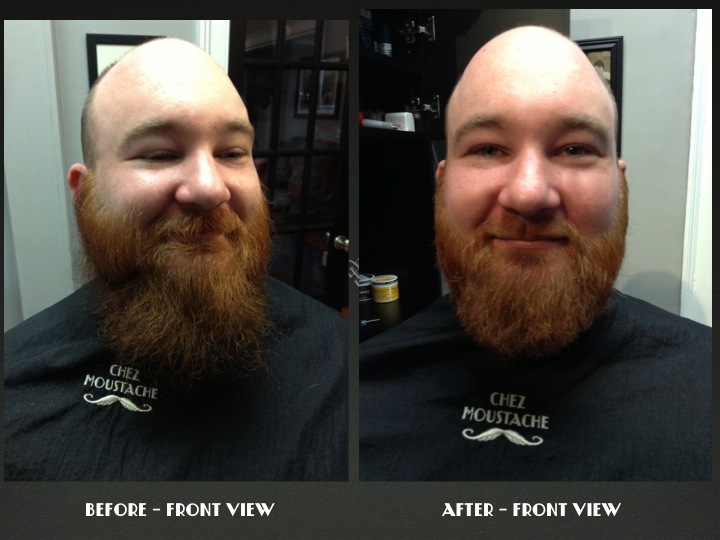 Seeking a professional eye for your beard’s lines can make a huge difference. A slight change to a neckline or cheek line can enhance your appearance. The Rogue Beard – This for the man who considers himself a traditionalist. The guy who believes that any trimming, cutting or clipping will doom his team. That mountain -man rogue beard look doesn’t have to be messy. Keep it clean by washing and conditioning your beard in the shower. Keep it combed, and apply a beard oil or hair cream to make sure it is soft. 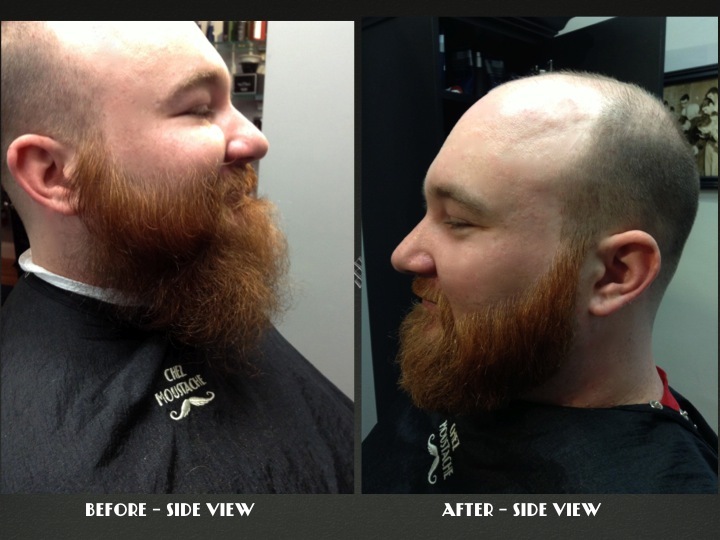 Seeking a professional eye to help sculpt the beard’s lines can make a huge difference. 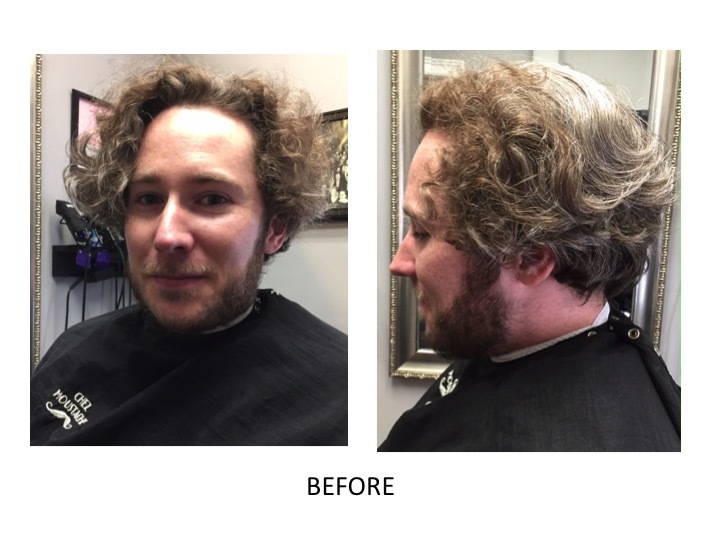 Removing The Beard – The take down can be pretty dramatic, and taking care of what’s under the beard is equally as important as the hair grooming. It is important to use daily an oil or cream conditioner in your beard. 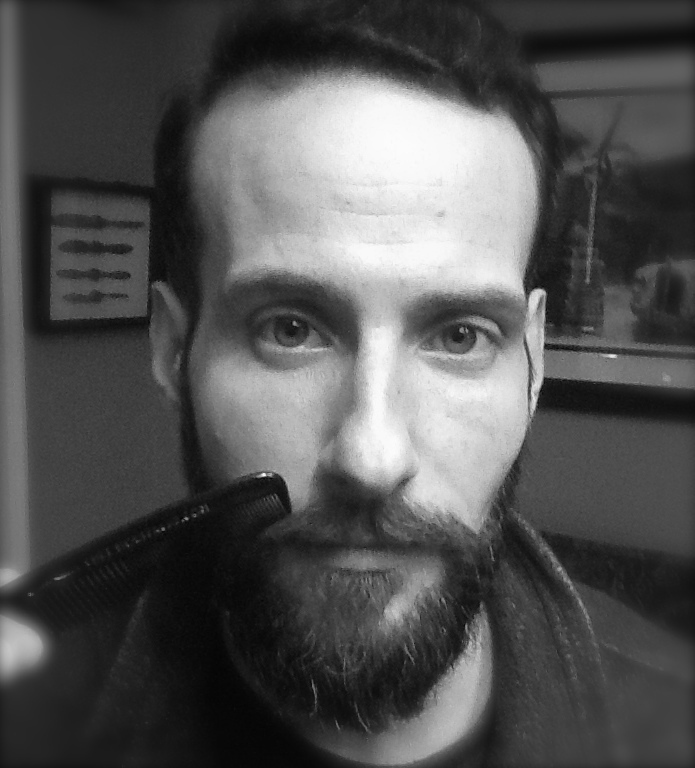 At Chez Moustache we use beard oil and hair cream for this purpose. The skin under your beard needs that conditioning otherwise it can get dry and red. Maintaining your skin under the beard will ensure that once the beard is removed your face is looking its best. Is Your Haircut an Afterthought? 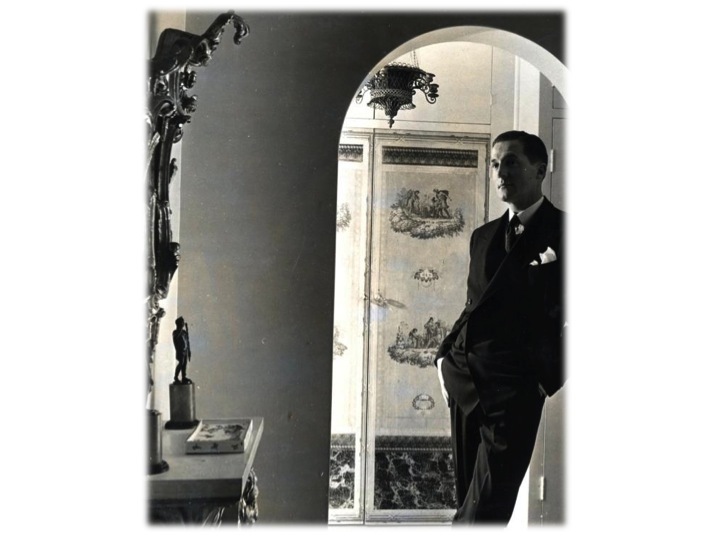 Born in London in 1909, Sir Hardy Amies became a fashion icon and designer. In 1964 Amies published, “The ABC of Men’s Fashion,” which was a guide to style and dressing for the modern man. Designer and fashion icon Hardy Amies once said, “A man should look as if he had bought his clothes with intelligence, put them on with care, and then forgotten all about them.” At Chez Moustache we believe that the well-coiffed man ought to make the same thoughtful impression. You would think it common sense that making a good impression has to include one’s hair. After all it does sit there right on top of that (hopefully) well-dressed body. Apparently this isn’t common sense to many men. We receive countless last-minute pleas from desperate clients and non-clients in need of primping for an important event. We are amazed at how many men consider their haircut as an afterthought. It all begins with establishing a relationship with a good barber. Just like any other relationship in your life, you have to give it time and work at it. That means being thoughtful and planning your time to build a rapport with your barber. You never want to be the guy whose back, neckline and hair have all grown together. We recommend scheduling a standing appointment every 4-5 weeks if you have a longer hair style, and for very short hair a neck cleanup and shaping every 2-2 ½ weeks. Planned grooming keeps you consistently sharp and never looking like you just had a haircut. 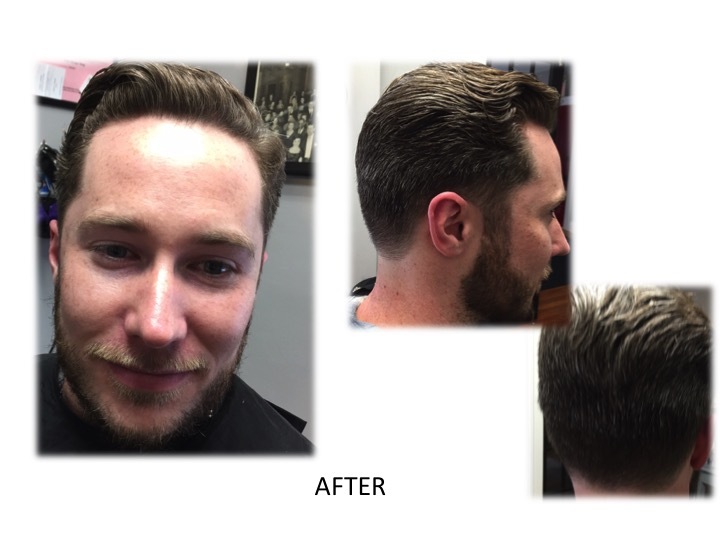 We’ve had the pleasure of easing many of our clients away from the “comb-over” and into a more modern and handsome look. Find a barber that you can talk to about your hair goals. Pictures are good to bring in, but be realistic and make sure the model has similar hair to you. If not, you may set yourself up for a disappointment. 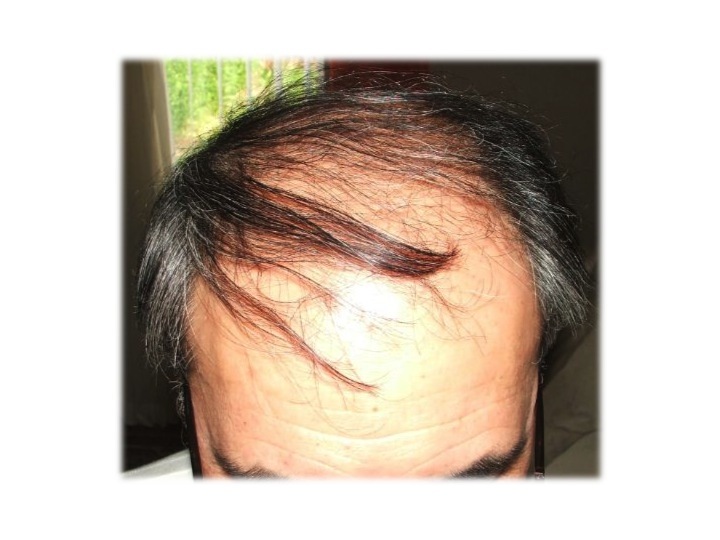 Male pattern baldness is a common challenge in both the psychology of letting go of a past look, and in finding a handsome new look working with what you have left on the top of your head. You ought to feel comfortable talking this out with your barber, and he should respect your wishes. 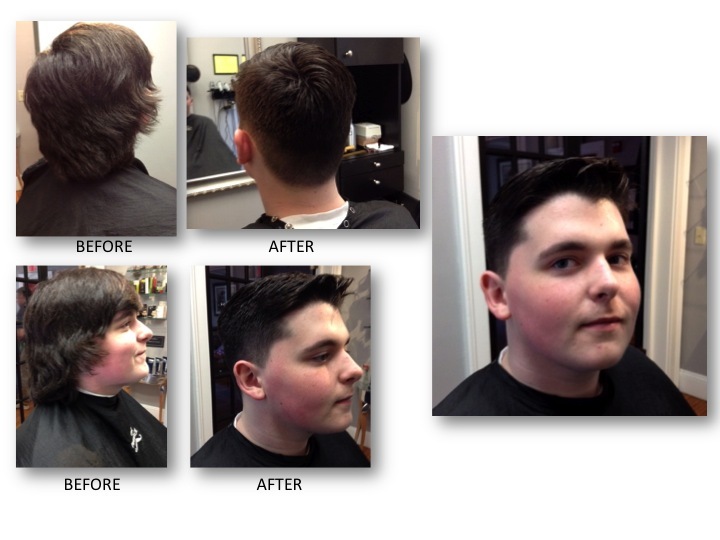 We’ve had the pleasure of easing many of our clients away from the “comb-over” and into a more modern and handsome look. 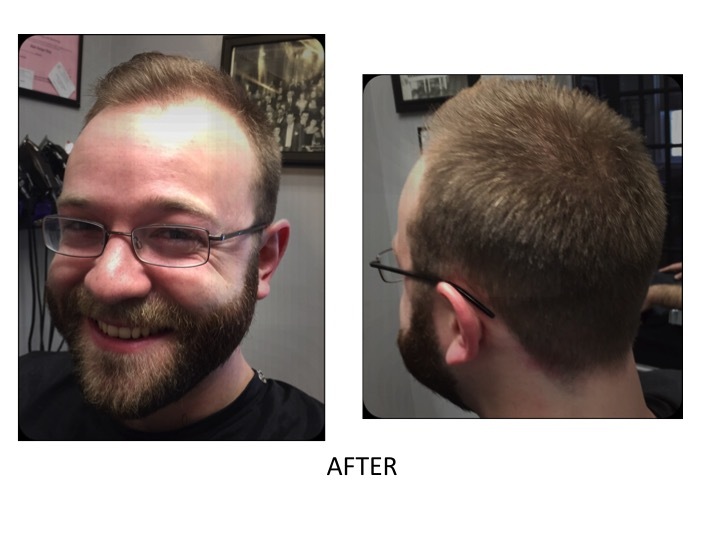 Talk to your barber about your hair and your head: Do you have any cowlicks, bumps or lumps? Every head is different. Do you know exactly what you want? Or do you want a recommendation? There’s a relationship between client and barber that grows over time, but the consultation paves the way for the client to leave satisfied right from the get-go. Consider putting the same priority into finding a good barber and maintaining your grooming as you would in maintaing your car. Most men can relate to the priority of maintaining their car. 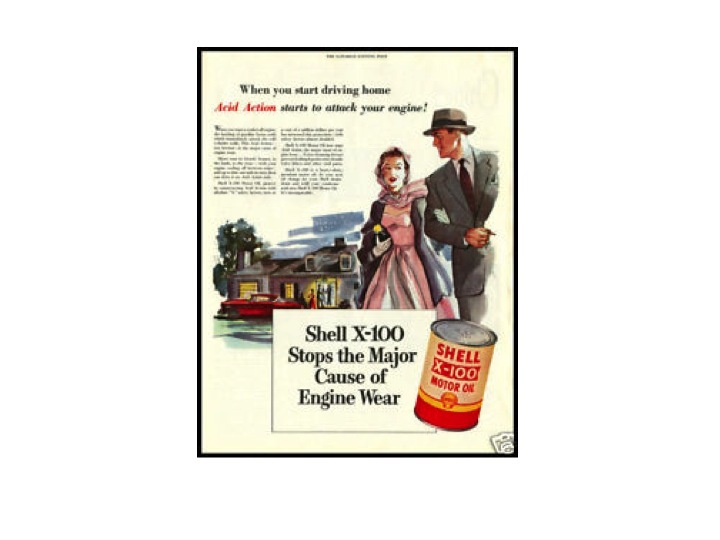 They wouldn’t think of missing an oil change, and consider having a good mechanic to be a top priority. We hope you will consider putting the same priority into finding a good barber and maintaining your grooming as you would your car. American writer Elbert Hubbard said, “A man is paid not for having a head…but for using it.” At Chez Moustache we ask — Why not make it a well coiffed-head?